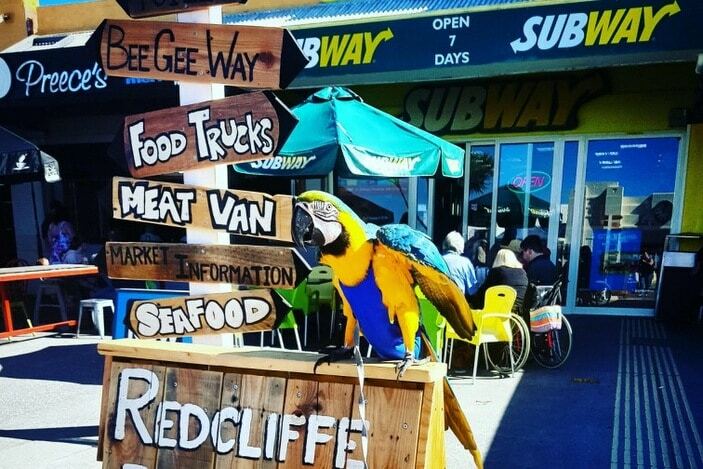 The Redcliffe Jetty Markets is a lovely Sunday market that the whole family will enjoy. Come for the farm fresh produce but stay for the great food, exciting entertainment and wonderful beachside location. 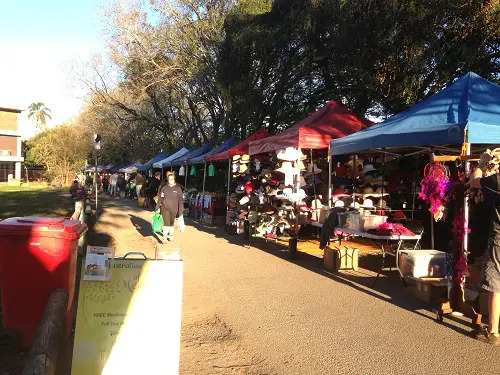 The Redcliffe Jetty Markets are held every Sunday from 8am to 2pm. Set right on the foreshore and next to the Anzac Place Parklands, this market is in a stunning location where you can spend a whole day. 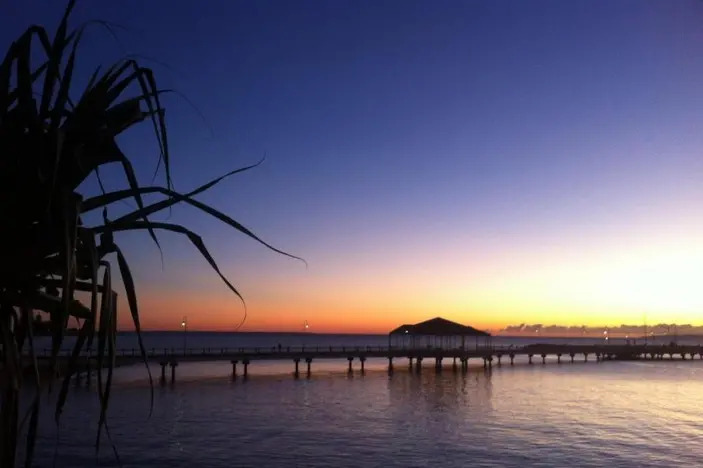 Stroll along the sand, have a dip in the ocean, take the kids to play at the beachfront playgrounds, and grab a bite to eat to enjoy by the seaside. This is what Sundays in Brisbane are all about! 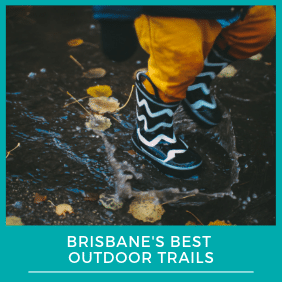 Brisbane locals love to come to these markets for the produce such as fruit and vegetables, which are farm fresh, super tasty and usually longer lasting than their supermarket counterparts. The markets offer way more than just groceries though. You can find quality arts and crafts, handmade items and jewellery. There’s clothing and children’s toys, as well as exotic imports. You can also enjoy lovely refreshments at the markets, including food, drinks and ethnic food specialities. 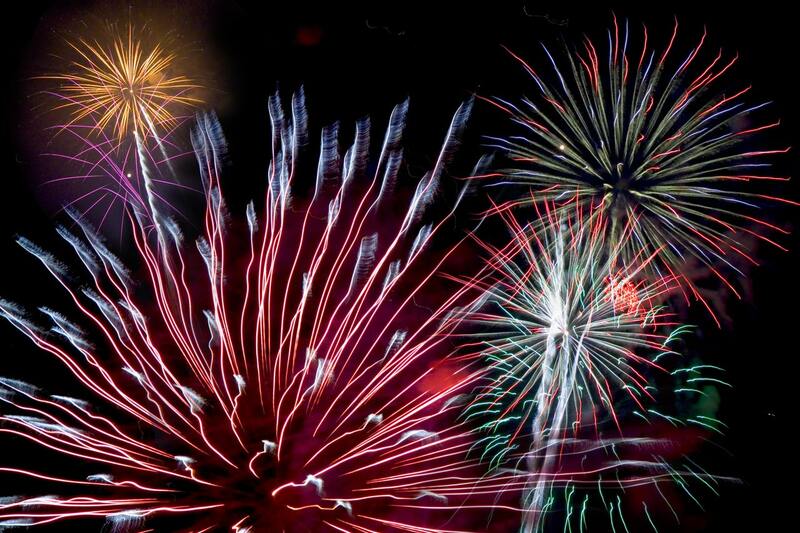 This great market offers a range of great entertainment for adults and children alike. There is live music to keep market goers entertained as they shop. The musicians always put on a good show and their timeless tunes help to create a lively and exciting atmosphere. 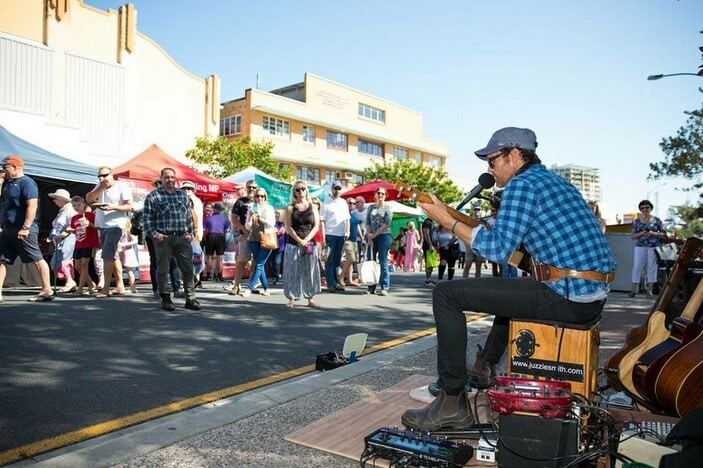 There are also often several talented buskers at the markets, showing off their skills or entertaining the crowds. In the centre of the markets, you will also come across Bee Gees Way, a fascinating laneway that links Redcliffe Parade with Sutton Street. This unique walkway was designed in collaboration with Barry Gibb and commemorates the career of the trio of Gibb brothers who formed the pop group and once lived in Redcliffe. This outdoor tribute features photographs, artwork, album covers and more. There are also life-sized statues of the Bee Gees, plus a video screen playing interviews, Bee Gees songs and other footage. Come here in the evening, and you can experience a light show set to the music of the Bee Gees’ greatest hits, every half hour from 7pm till 9.30pm. 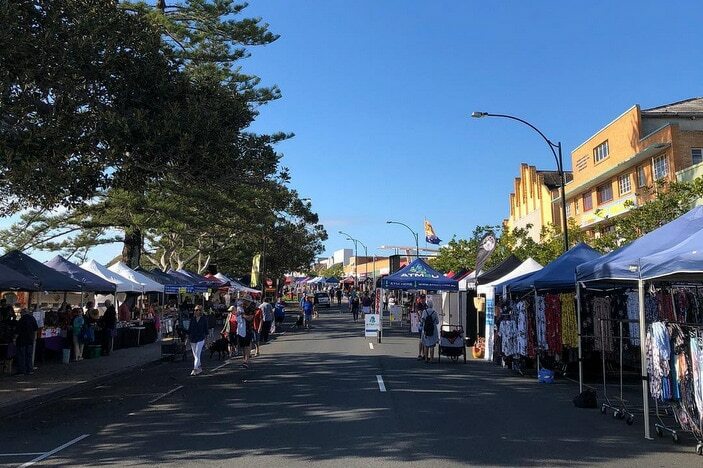 The Redcliffe Jetty Markets also hosts special events throughout the year, such as a special Mother’s Day market and their Good Friday market. 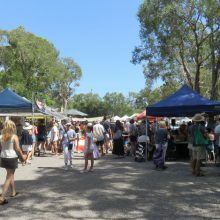 Follow their Facebook page or visit redcliffejettymarkets.com to keep up to date with the latest event news. For families with fur babies, it’s great to know that the Redcliffe Jetty Markets are pet friendly. However, as the roads and pavements can get very hot under little paws on sunny days, please consider this before deciding whether or not to bring your dog along. In addition, following council laws, all pets must be kept on a lead and owners must clean up after them. This weekly market plays an important role in the local community and supports the community in return. For example, it runs a Community Benefit program in order to help local community groups attend the market. It also supports many local and charity events, such as the Salvation Army, Rotary and the Redcliffe Surf Life Savers. 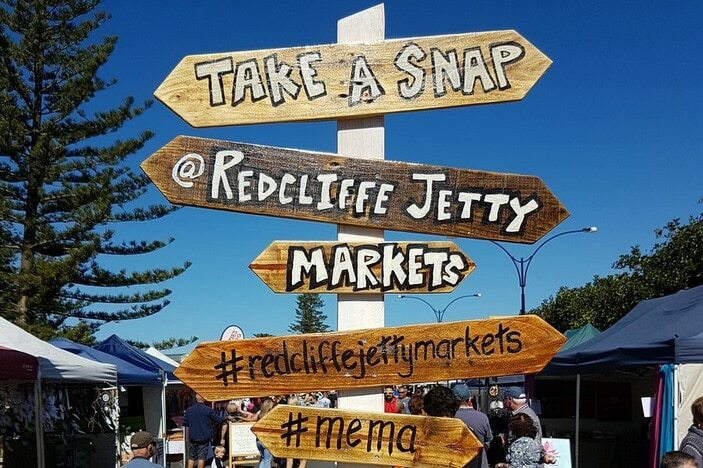 The Redcliffe Jetty Markets are located on Redcliffe Parade in Redcliffe. There are car parks nearby, and street parking is also available. Please note that Redcliffe Parade itself is closed during market days to make space for this lovely community event. 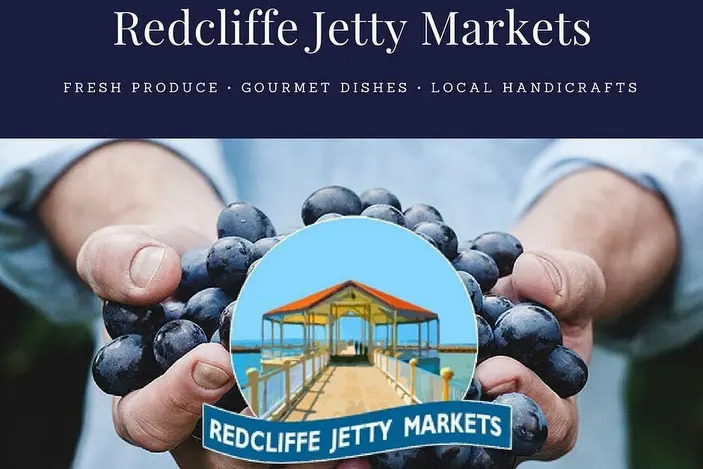 For more information on Redcliffe Jetty Markets, visit redcliffejettymarkets.com, check out their Facebook page here, or call (07) 3284 4702 or 0425 304 678.